Himachal Pradesh is located in the northern India. This state was formed on 15th April 1948. It shares its border with Jammu & Kashmir, Punjab, Haryana & Uttarakhand states. As per the data recorded by census 2011, the average literacy rate of this state is 82.80 %. Himachal Pradesh has several reputed institutions like IIT’s, NIT’s & many others which offer quality higher education. Students from different states come here to pursue higher education in different fields. Through this article candidates can check the list of Top Engineering Colleges in Himachal Pradesh 2019. Here, at Sarvgyan.com, we are presenting a list of top engineering colleges in Himachal Pradesh for the session 2019-20. This list includes the Indian Institute of Technology (IIT) – Mandi, National Institute of Technology (NIT) – Hamirpur & many other engineering government & private colleges. These colleges offer engineering courses in various disciplines. While preparing this list, various important factors have been considered such as national importance, quality education, placement records, facilities provided by colleges, affiliation & approval, student’s reviews and many others. Students can appear in the JEE Main examination to get admission in UG engineering (B.Tech) programme. JEE Main is a national level examination organized by National Testing Agency (NTA) for providing admissions in B.Tech & B.Arch courses. The application forms are released for 2019 session. Students looking for admission in IIT are required to qualify JEE Main & JEE Advanced both examinations. For admission in M.Tech courses, students can apply for GATE examination. 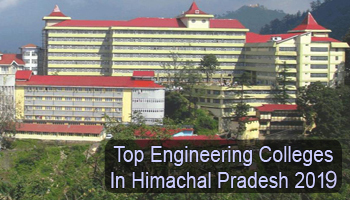 Various colleges & institutions of Himachal Pradesh offer various engineering specializations. Some trending specializations are Computer Science & Engineering, Civil Engineering, Mechanical Engineering, Electrical Engineering, Aeronautical Engineering, Electronics and Communications Engineering, etc. For any other queries about Top Engineering Colleges in Himachal Pradesh 2019, you may leave your queries below.